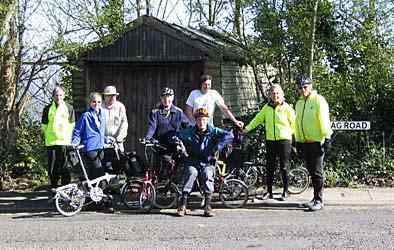 A number of regular participants in the monthly Origami Rides in the Midlands occasionally venture further afield for weekend outings. The first of these took place in 2001 - a visit to Wales taking in visits to various places of interest, especially steam railways (The Welsh Trains Ride). Since then we have had several other outings, even visiting France in 2002. Our folders play an essential part in these trips, but cycling is not the sole purpose of the activity - we visit places of interest, often with a transport theme. 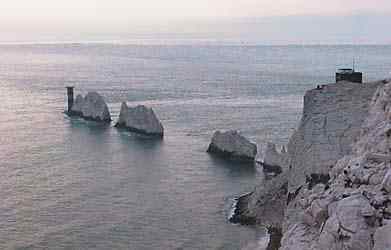 A visit to the Isle of Wight was originally suggested last year by Paul Evans (who has organised many, though not all) of our trips. The idea was welcomed by everyone, so Paul went ahead with the planning. At one stage we hoped we might be able to combine our visit with the date of the Moulton Bicycle Club ride on the Isle of Wight, but unfortunately it turned out that the date of the latter clashed with one of our regular Origami Rides, for which plans had already been made, so our visit was instead arranged for 16 - 18 April - quite often we find it more effective to add an extra day to the weekend when travelling this far to a location. 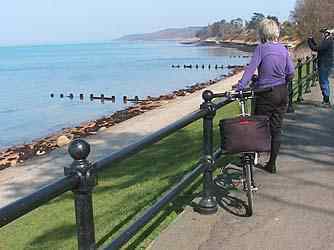 The basic plan was to ride around the IoW using more or less the signed route, but taking in various interesting locations, and sampling as many different forms of transport as possible. As we would only be away for 2 nights, luggage was not too much of a problem. Rosemary was using a small back pack (luggage is not as easily catered for on a Micro), while the others used Brompton front bags - two of the touring bags, and the rest the usual, smaller, front bag. Susan, Paul, Dave and I met up at Birmingham New Street for the train journey to Southampton, where we were met by the others, who had travelled down by car from further south. The train was somewhat delayed, which meant that, after a short bus ride, we were on a later ferry than we had originally planned. 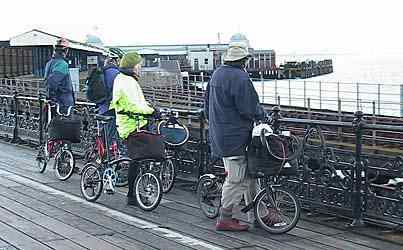 The Jetfoil journey to the Isle of Wight took only 20 minutes - conventional bikes are not allowed, but our folded and bagged Bromptons and Micro occasioned no comment, especially as the ferry was almost empty. Although there had been a bit of rain around Birmingham when we left, it was dry and sunny by the time we reached Cowes, so we lost no time in getting on the road. A sharp climb out of Cowes was an unwelcome start when we had not developed our pedalling rhythm yet, and prompted several of us to peel off a layer of clothing. As lunch time was fast approaching, we stopped quite soon for a meal at a convenient pub, where we were able to sit in the sun in the garden relaxing and discussing the plans for the rest of the day. 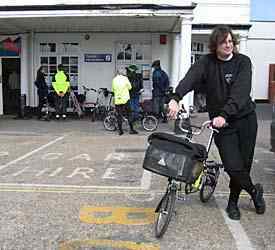 Dave poses with his Brompton while the others finish unfolding and stowing their luggage after our arrival at Cowes. Dave's bike is fairly lightly loaded at this stage - as a PBP rider he found this a rather easy ride, so he later volunteered to carry luggage for some of others! Above: On the road to Yarmouth. From there we continued our leisurely way on the round the island cycle route, with regular stops to admire the view, and a tea stop Yarmouth. From there we made our way to our overnight accommodation at Freshwater, where we dumped most of our luggage before riding out to The Needles. Due to the train delay, we were a bit behind schedule, so we arrived there too late for Paul to investigate the glass blowing activities, but at least we were able to get a view of The Needles, though haze reduced the visibility a bit. There was quite a good view of The Needles from the pleasure park, and the climb up to the Old Battery looked rather intimidating, so half the group rode back to Freshwater, while the more energetic ones went on the additional short distance to the top - in fact the climb was much easier than it looked, with the exception of the last 50 metres or so. Below: At the main viewing point a The Needles Pleasure Centre, and the view from near the Old Battery. Following our night's rest in Freshwater, we prepared to set out on what was to be the longest day's cycling, so we were very relieved that the weather was once again sunny and warm. We were aiming for a 9:30 start (breakfast was not available until 8:30, and we were to meet up with Brian Wey and perhaps some other locals then). By 9:30 Brian had not appeared, but Dave had just found that his rear tyre was flat, and Susan's rear tyre was also rather soft, so he set to work to fix his puncture, by which time Brian had arrived. Susan's puncture was evidently only a slow one, so some more air was put in the tyre and Dave promised to fix it later. Although much of the route from Freshwater was along the main A4035, there was little traffic, and sticking to this road gave us good views. There was some fairly strenuous climbing involved along here, especially for those with more limited gears, and it became evident why Brian as a local favours the Birdy Blue, with the wide range of gears provided by the Sachs 3 x 7 system. Our numbers were augmented during the morning by two more locals, one on a Bike Friday (to add a bit more variety to the range of folders!) and one on a conventional non-folding large wheeler(!). Some discontent was being expressed amongst the ranks at the failure to find a stop for morning coffee, and when we did finally find a suitable location, it was mid day, so we decided to convert this into a lunch stop. Immediately after lunch we were confronted by the climb at Blackgang Chine, which was hard work, and although we got the benefit of a descent afterwards, our climbing was by no means over for the day. On our way to Ventnor, we stopped at another glass blowing establishment, where we were able to watch, if not blowing, some rolling and inspect the wares - most interesting. 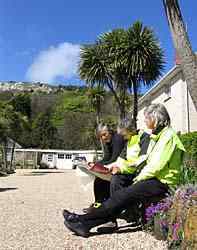 Soon afterwards we made a short stop at the Botanical Gardens for afternoon tea, before riding on to Ventnor, where we planned to look for the old railway station, or what remained of it. 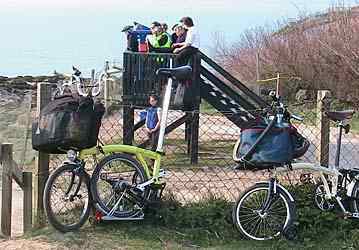 those who were at the Folder Forum at Ventnor will no doubt recall that it is quite hilly, and Zig Zag Road in particular may bring back memories. We struggled up there and then finally found what remains of the station/ railway - an industrial estate, with the bricked-up tunnel the only real evidence that there was once a railway. Some more climbing was called for on the way out of Ventnor, with Brian reassuring us, several times and rather unconvincingly, that this was the last hill before we reached our overnight stop at Sandown. So far the weather had been excellent, but the forecast for the last day was very poor, and looking outside on Sunday morning it was evident that the forecast had it right. However, this was fortunately the day on which we were due to do least cycling, and the most travel on trains. Our ride to the station was only a couple of hundred metres, but it was becoming evident that the puncture in Susan's rear tyre needed more attention. The ex-London Underground electric train took us to the end of the pier at Ryde, where Dave decided to repair the puncture while the rest of us, apart from Susan, rode (or walked) back from the end of the pier to watch the hovercraft arriving and departing. Dave and Susan rejoined us on the train from Ryde to Smallbrook, where we disembarked in heavy rain to see firstly how many people could squeeze into the small shelter on the platform there, and then to catch the steam train. The capacious luggage van easily swallowed the 8 bikes, and we enjoyed the short journey to Havenstreet, where we got off to partake of refreshments and look around the station and museum. Some of opted to stay at Havenstreet, while the rest caught the returning train back to Smallbrook We joined up again as the train returned, and rode on it to the terminus at Wootton. Above: Waiting for the train - the puddles give some indication of the weather, and coming back down the Pier from the station. 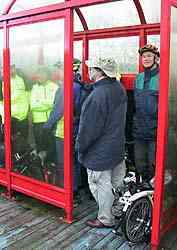 Below: Huddling in the small shelter waiting for the steam train. 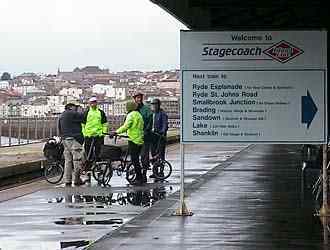 The weather was continuing to be damp and rather miserable, so we were glad that the ride into Newport was quite short, and there we stopped for lunch. Paul and I sampled transport museums here (bus and boat), while the others stayed at the lunch stop. Conditions were distinctly damp for the final section of the ride into Cowes - Dave in particular was regretting not having any waterproof trousers. Those of us who had come down from Birmingham by train were in no hurry at this stage - indeed we had time to kill, as we were booked on a fairly late train, but the others were able to take advantage of our arrival rather earlier than planned, due to the weather, to take the ferry back to the mainland and then pick up the car for their return journey. A lack of any refreshment facilities on the station in Southampton was bad news, and the displays showed our train was running 10 minutes late into the bargain. Some considerable panic resulted when at the last minute the display changed to show the train was back on time, but arriving on a different platform! Fortunately we managed to get to it in time. I had been uncertain about my connection for a local train at Birmingham, but we arrived there about 15 minutes earlier than I expected (I think the timetable was showing the departure time from Birmingham, rather than arrival time), so not only had I plenty of time to make my connection, but it was a local train stopping at Tipton, so I did not need to ride a final 5 miles from Sandwell & Dudley at nearly midnight. I found my SP just about ideal for this holiday - as portable as a standard Brompton, but with more gears, more evenly spaced and with a wider range. It's lighter too, and rolling resistance is remarkably low. Luggage is easily carried, as with any Brompton. I noticed when I arrived at Birmingham New Street at the start of the outward journey that there was a worrying bulge in the side of the rear, Primo, tyre, and some evident fraying of the casing. My early SP is handicapped by very narrow mudguard and rear derailleur mechanism clearances, which means that Brompton, Raleigh and Schwalbe Marathon tyres won't fit, and originally this limited me to the Primo. Actually I had a spare Primo with me, but in the end the tyre lasted out - I'll be commenting on the question of tyres in the near future elsewhere in the web pages. Apart from 3 punctures (all Brompton tyres) and a bulging side-wall on another tyre (Primo), the bikes all behaved perfectly. Without folders we could not have planned a holiday like this one, and the combination of some fairly gentle cycling, general sightseeing and sampling many different forms of transport was ideal. This was a very enjoyable holiday - many thanks to organiser Paul Evans, who, as always, had planned the details meticulously.